Is the Lantek Factory concept a decisive factor in the consolidation of Lantek’s leadership positions? With our traditional products, we can continue to increase market share. Manufacturing is increasing worldwide, with more and more countries becoming increasingly industrialized and thus needing these tools. What Lantek Factory is providing is the capacity to make a more cross-cutting and vertical offer to a company. We no longer only offer a specific solution; but, we are also able to provide a solution that is already integrated into all the processes and can be connected to other company systems. We have gone from being a provider of a solution that the customer needed to being the partner on which it relies to continue growing. This is what differentiates us and is helping us to penetrate and to position our brand. Does this comprehensive support also imply increased customer loyalty? Yes, more than ever. Now it really becomes a relationship of trust because we are consulted on other business areas or on how we can help in the selection of other suppliers for the supply chain. Lantek is not only involved in CAD/CAM, but has also expanded into management areas, which has earned us more trust from the customer. Is the MES system an example of this? We are indeed the leading supplier of industrial software with an MES (Manufacturing Execution System) for sheet metal. This was the point where we moved from the machine to the management of the entire factory and from there to the commercial circuits: purchasing and finance and the integration with other elements. Through this implementation control system, we handle the machines and their queued work; we know their loads and their progress; and, we can report all of this information upstream. And that, as it is conceived, makes Lantek unique. Nothing like it exists in the market. Another feature is that all of this has been built on a systems development platform with web technology. It is a small version with a large mentality so that it can evolve extremely quickly. How does Lantek implement manufacturing intelligence? Lantek provides intelligence to the supply and value chains. We have not just focused on this machine, but also on providing the technology or knowledge needed for advanced management of the supply chain, specifically related to the cutting of sheet metal. So far it has been a more abstract process. Te flow started because it jumped from a business tool to a specialized tool. There was no communication there. Now we are able to communicate, and not just within the company; but, also with external agents who could be raw material suppliers or customers. We are also offering more tools for building, for example, online stores, or for integration with software providers in order to meet the demand for material according to sales requirements. 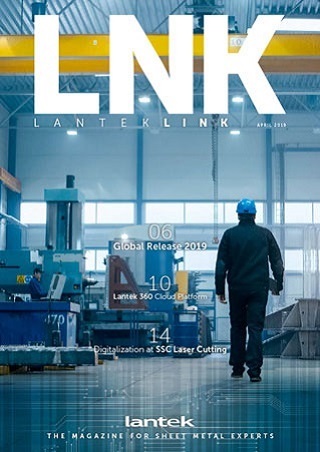 What has Lantek contributed to Industry 4.0 and vice versa? Lantek did not invent the Industry 4.0 paradigm, but it was already present in this area of work. Industry 4.0 has given us a vehicle to continue launching our digitalization mission and incorporate technologies such as big data or virtual reality. And in relation to customers? The greatest difficulty for our customers is understanding what Industry 4.0 can offer them. And this is where we come in, leading the way in talking about the technology available and how we can understand it in a particular sector. The technology and expertise that Lantek brings to the process converts plants into smart factories. The digitization process and integration into a global production system (smart factory), as well as proper data management, provide the customer with diagnostic and control capabilities that ensure improved productivity. This is what has happened in the area of virtual reality: we have been able to apply and to transform it so that our customer can interact with it, resulting in a conversation which leads to a solution or a new technology. What technological challenges will Lantek face in the future? We believe that the future lies in anticipation. So far we have been delivering systems which offered implementation control. Today, we can anticipate in order to avoid problems or to propose solutions. We believe this is the most disruptive aspect at this moment for the industry. Our customer will know in advance any overload issues, situations and machine problems for the entire process, from order to delivery, in order to handle them better. The other challenge is to continue connecting. The value chain should be fully connected so that it is a network and can support the customer in different ways, depending on the moment, workload, circumstances, or specialization.